Unfortunately, for commercial reasons, the management at both The Wagon and Horses in Lancaster and The Black Bull at Bentham decided to stop having jazz. Although we did try one or two other local venues, we couldn't find a venue in the area which would support live jazz on a regular basis. With most members of the band having regular commitments with other bands, we reluctantly decided that we couldn't carry on as The New Riverside Band. Like many of those who came along to our weekly sessions at The Park Hotel and The Wagon and Horses in the early days, we remember very fondly the band in its heyday, led by Alan, with his fiery cornet and incredible repertoire of New Orleans classics, and Delia, with her inimitable contribution of classic blues. We can't recapture those days, but they will live on in many memories. The New Riverside Jazz Band made a huge contribution to traditional jazz in the Lancaster area for over 30 years. Based in Lancaster, the New Riverside Jazz Band has been a major player on the traditional jazz scene in North Lancashire and the Lake District. Evolving from a number of jam sessions in the Bowness area in the early 1980's, the band came together under the leadership of Alan Duckles to take up a weekly residency at The Park Hotel in Lancaster in 1983. After a few early changes of personnel, the line-up became established with founder members Alan Duckles on cornet, Barrie Marshall on clarinet. 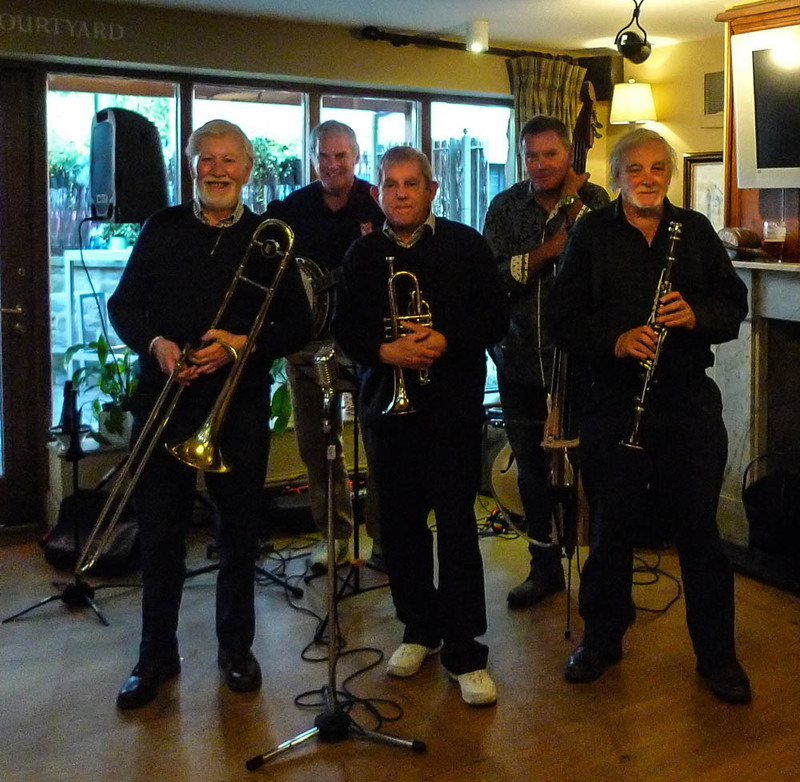 They were joined as regular members by Matthew Woodhouse on trombone, Dave Bateman on banjo/guitar, Malcolm Hall on bass and Peter Eddowes on drums. The band was augmented by Delia Glaister, one of the leading blues singers in the north west, and by crooner, John Perella, and enabling the band to offer a wide repertoire from classic New Orleans and Bessie Smith, to the swing era and Bing Crosby. The band took its name from The Riverside Jazz Band, which was Alan's original Lancaster-based band of the 1950s. Quickly establishing a regular following, the band was joined by the legendary Cy Laurie to celebrate its third anniversary - and later its tenth anniversary. During the 1990s, the band made regular appearances at The Keswick Jazz Festival, appearing in its own right as well as providing for support for such artists as Digby Fairweather and Neville Dickie. Delia was in great demand as a blues and gospel singer, and for several years, the band featured at the Sunday evening church service at the Keswick Festival. From within the band, a quartet took up residency at the John O'Gaunt pub in Lancaster on Sundays, under the name of The Sun Street Stompers. Later, another offshoot of the band became The Quayside Hot Stompers, when Alan and Barrie joined forces with pianist Tom Culbert to concentrate on classic New Orleans Jazz. All three bands featured prominently at jazz venues throughout the north west, and at several jazz festivals nationally. The Sun Street Stompers continued to play a weekly Sunday gig in Lancaster, and have recently returned to The John O'Gaunt under Barrie's leadership. The weekly residency at the Park Hotel continued for many years, but a change of management led to a change of venue, and the band moved to The Wagon and Horses on the quayside at Lancaster. The weekly Thursday evening sessions were legendary, with plenty of regular support. The band was in great demand for private functions, and went over to Germany to take part in a festival in Rendsberg. But inevitably, changes occurred. Sadly, within a very short period, we lost both Delia and Malcolm to cancer. Delia was irreplaceable, and her very wide repertoire of classic blues has been much missed by the band and its supporters. With Alan, Barrie and Dave remaining at the core of the band, there were a number of changes of personnel, including Alan Mathews joining on trombone. With the ever changing pub scene in Lancaster, we went through a succession of venues until finally returning to The Wagon and Horses on the quayside, where we can still be found on the first Thursday of every month. We were pleased to welcome Adrian Morris as our regular bass player, and when drummer Ralph Wilson retired at the end of 2015, we decided to continue as a 5-piece band, which is our current format. In 2015, We took up an invitation for a residency at the Black Bull at High Bentham, initially once every other month, but currently on a monthly basis, and we are developing a regular following there. But the 'Wagon' continued to be our spiritual home, and it had been very pleasing to see so many familiar faces from the days when we were there on a weekly basis, and to welcome many newcomers to the world of jazz, but sadly that residency came to an and at the end of 2017. "At long last the sounds of New Orleans were heard at the Park Hotel, Lancaster, last Thursday night, with the New Riverside Jazz Band providing the music. A large crowd at the refurbished Park enjoyed a mixture of rags, blues and, up-tempo numbers. Dave Wareing was on bass and led the band. The rest of the line-up consisted of Alan Duckles, trumpet; the enthusiastic Barrie Marshall on clarinet; Keith Woodhouse on trombone; Richie Williams on drums and the petite, Ellie Edgar on banjo. Other guests included Harry Black, Delia Glaister, singing some earthy blues and vocals from the subtle John Pirella, its a night not to be missed".